Evidence has surfaced that points to Nvidia working on both a new Shield Controller as well as a new Shield Remote. This is based on two new device codenames unearthed from Nvidia’s latest public source release, namely Stormcaster and Friday. The first is a controller and the latter a smaller remote. And if Nvidia is working on new controllers, then it would stand to reason that we could be in for a new Shield device releasing this year too. It’s been a couple of years since Nvidia last refreshed its Android-powered Shield TV box, but it still remains the best little box of tricks to plug into your tele. 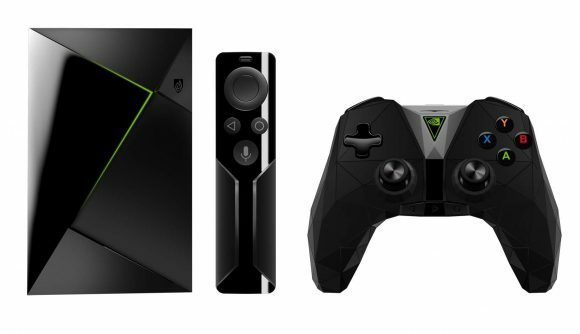 The Android TV OS is solid, and has improved a huge amount since its inception and, if you’re a GeForce gamer, it’s the perfect way to play PC games in your living room. Whether that’s streamed from your gaming rig upstairs or from the cloud via GeForce Now. The current Shield unit from 2017 is still a mighty powerful little device too. Its Tegra X1 silicon is powerful enough for any Android app you want to throw its way, and it’s also one of the best-supported media players too. That does beg the question, however, why would Nvidia bother to update it now? The codenames have come from a story on XDA Developers and goes into why it thinks Stormcaster and Friday would be used for Shield peripherals. It’s mostly based on the fact that the current peripherals are referred to as Thunderstrike and Pepper, and the fact that Stormcaster is denoted as a Bluetooth HID controller, which accepts USB input too, and the other is a Bluetooth HID remote. Nvidia did respond to the site’s enquiry into the codenames and doesn’t deny they exist – they are, after all, included in a public Nvidia release – but it does point out that it can’t say “which codenames refer to product concepts that are active vs which ones are inactive.” It does confirm, however, that the two new codenames definitely do not refer to products which have launched publicly, but doesn’t go into whether they might actually be planned for production. Tangentially, an eagle-eyed, though rather intrusive commuter has spotted an Nvidia employee working on a document about Project R.O.N. The uploaded image seems to refer to the developer submission deadlines for a potential Google Home-like device with rather Shield-y styling. The blurry zoomed-in image seems to refer to an early May and late June deadline for new Project R.O.N. ‘skills’ using hologram and AI respectively. Quite what Project R.O.N. ends up being is, at the moment, unclear. It could actually be a new Shield TV device, or something in the Shield family which, like the Google Home, doesn’t need to be plumbed into a screen. If Nvidia is working on a controller and remote for a new Shield box though it certainly wouldn’t be a stretch to think these two leaks might be in some way related.